Rory is suffering what I like to call ‘undiagnosable eye trouble’ or UET. This eye problem is causing me both mental and financial strain – about £600-worth so far, plus a trip to the doctors for me because he gave me conjunctivitis (a byproduct of whatever is wrong with him). Saturday AM – Eye so swollen I have to take him pretty much straight to the vet, he can barely open it and I’m not loving the idea of having to rush him to the vet on Sunday. Vet has a good poke around, says she can’t see anything in the eye, that he’ll probably be fine on a course of eye drops – very strong, stinging eye drops I might add – until Thursday. If he is fine by then the vet says he will probably be fine and doesn’t need to come back in. There is a passing suggestion of Rory having to be knocked out so the vets can have a proper look. It’s glossed over. I’m relieved it doesn’t seem necessary. Saturday PM to Thursday PM – Swelling gradually goes down. Eye is almost back to normal by the end of Thursday. I follow instructions and stop putting the eye drops in. Saturday AM – Eye is looking a bit more swollen again. I call the vets and make an appointment for Monday evening. Sunday AM – Rory’s eye is back to being so swollen he can’t open it and as it is getting progressively worse I have to take him to the vet. I time it so I go within the clinic times (ie tiny percent cheaper than total weekend out-of-hours). I see another vet, she’s lovely. She pokes around in his eye. Tells me she’s never seen anything like it. Recommends putting him back on the eye drops and coming back on Monday evening. I have to cancel the Monday appointment I’ve already made and make another with the practice partner. Me and Rory head home again. Monday PM – Me and Rory meet the very lovely practice partner. He tells me that he’s not sure what’s wrong with it either. Pokes around in it and still finds nothing. He recommends putting the eye drops in for a full course of seven days and coming back the following Monday. He seems to know what he is talking about so I agree. I feel much calmer after meeting with him. He mentions the eye specialist based nearby in passing. Monday PM to Wednesday AM – I put the eye drops in, as directed, every day, several times a day. Rory hates it because it stings. (At this point none of the vets have told me the eye drops sting, so I’m left thinking the dog is completely overreacting.) His eye gets progressively worse, not better. By Wednesday it’s absolutely huge and closed. I have a work photoshoot so I make a vet appointment and organise for my grandparents to take him. It’s another different vet. She’s never seen anything like it. She gives him a steroid injection, and as per my note arranges an appointment with the specialist for the Friday. She recommends I keep putting in the eye drops. Friday AM – Rory’s eye looks completely normal as a result of the steroid injection on the Wednesday. It shouldn’t do. The effects normally wear off in 12 hours. The specialist does every test he can think of and they all test as within normal ranges. He steps back, looks at me and sighs. He says that as far as he can see the eye is normal but clearly it is not. Without seeing it blown up he can’t tell me what might be wrong – we do discuss the potential for an allergic reaction or a foreign body in the eye. He sends me away with instructions not to do anything and if it blows up again to bring him back in. I ask if there is a reason the eye drops didn’t work the second time around, he says no, if they work once they should work again. Not doing anything means no eye drops, no medication at all. As I leave he says ‘hopefully it will all be resolved and I won’t see you again’. I say ‘I guarantee we will be back’. He nods knowingly. He says to contact him whenever I need to. He is very helpful, makes lots of helpful suggestions and tells me straight what he’s thinking. I like him. He allows me to vent about how disappointed and frustrated I am with the situation. He agrees. Me and Rory head home. Saturday AM – Rory’s eye has already started to swell. I call the specialist and make an appointment for Tuesday evening. I speak to a veterinary nurse who agrees I should probably put the eye drops in over the weekend but to make sure I stopped Sunday night so it would be flared up for Tuesday. Sunday AM – The eye is significantly worse. I am nervous and uncomfortable about it. Rory is depressed and lethargic for the first time in the whole process. He is clearly in pain and is not interested in anything. About mid-morning I notice there is a small amount of bleeding in the conjunctiva. I keep an eye on this but it stays pretty much the same. He spends most of the day sleeping. Sunday PM – Rory is getting more and more uncomfortable. Suddenly he goes from being completely asleep to violently scratching at his eye. I look at it. The bleeding is significantly worse. He is now pacing and clearly upset. I call out-of-hours at my vet (for the third weekend in a row – what was I saying about Timing), discover that they are very expensive and remember that they could do nothing last weekend either. I call the specialist practice. Another vet at the practice is on call and advises I bring Rory in. My friend who is visiting at the time drives us there. This vet, another new one, the sixth now, also is floored by Rory’s swollen eye and looks genuinely shocked at his appearance. We discuss the drug options in order that the specialist can see Rory the next day without too much masking, but also makes Rory comfortable. More poking around in his eye. Some talk of potential nerve damage or allergies. I go home with Rory on ‘speed’ so he’s buzzing. Before I leave I make the appointment for the following afternoon. Once home Rory settles down to sleep. 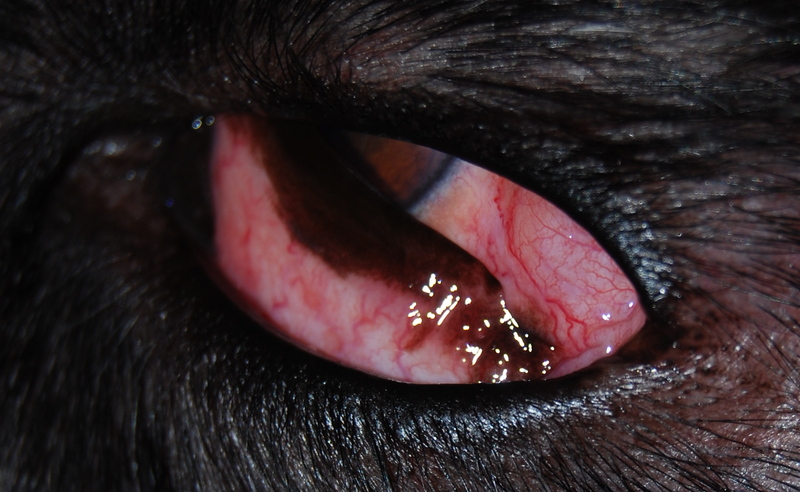 When he wakes up three hours later his eye is stuck together, when he opens it a whole load of bloody pus comes out. Gross. Tuesday AM – Tuesday AM – I continue with the course of treatment. It seems to be working and Rory’s eye returns almost to normal, with one difference. There is a lump in the corner of his eye. I take photographs of this and email them to the vet. Monday evening I start reducing the medication down as discussed with the vet. Tuesday PM – Rory’s eye is already looking a little more swollen. The lump is no longer visible. I continue with the treatment. Wednesday AM – I realise I only have enough medication to last until Monday when I am supposed to be seeing the specialist again – except Monday is a bank holiday. I am *not* having another weekend/bank holiday vet visit. I call the specialist’s practice. There is some confusion over how many drugs I do or do not have – mainly from my side. The specialist is to call me back. Wednesday PM – Specialist calls me back. Tells me my photography is another league (well… you know… *blushes*) and suggests I take all his photos from this point onwards. We discover I have been given less drugs than necessary. Specialist arranges for me to pick them up from my normal vet the next day. Thursday PM – I drop by the vets to pick up the drugs. They aren’t all there and my vet is busy. I have to rush off. Later I have a long and complex conversation with my normal vet where he tells me Rory is on the top level of drugs he can safely have. I arrange to pick up the missing drugs. All the drugs now have different names and doses so it’s like learning a whole new system. Friday AM – Tuesday PM (TODAY!) – His eye seems to be stable on the medication at the moment and I’ve finally got to grips with the dosages. We’re in a routine. Next appointment is next week and the drugs will run out two days before. Wish us luck. By the looks of it, Rory might need to be knocked out to have a look at the lump (*sad face* scary stuff), but maybe not, so I’m not thinking about it. Dogs eh? Lucky we love them. And the vets have been fab, the vets receptionists now know me and Rory by name. Unfortunately it’s not just the eye thing we’ve needed them for. Fortunately we’re insured!